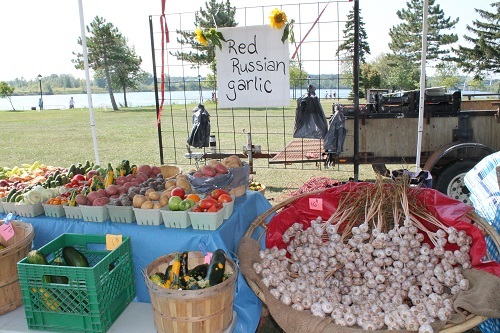 CFN – It was a great day for the 1st Annual Eastern Ontario Garlic Festival in Cornwall’s Lamoureax Park. You couldn’t have asked for better weather. It was bright and sunny with a cool breeze blowing off the river. 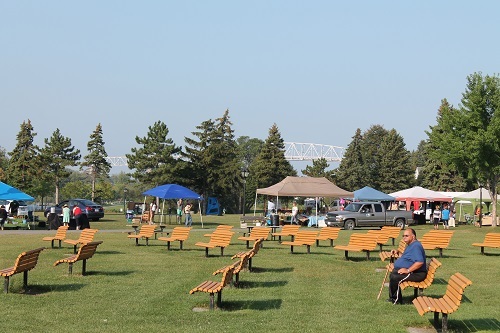 While we were setting up at 8 AM you could see the sun reflecting off what is left of the old international bridge. The bridge will probably not be there for next year’s event. 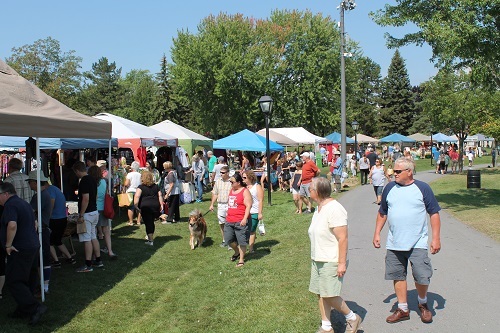 The number of vendors participating was totally unexpected. 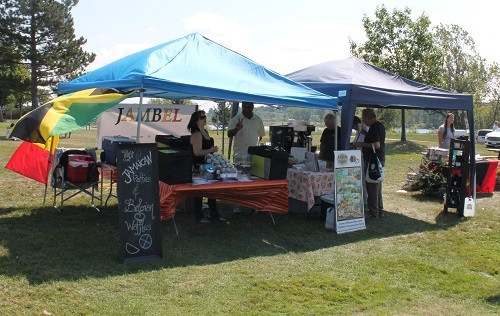 I didn’t know what to expect when I signed up to sell my coffee but I was pleasantly surprised as I watched all the small businesses setting up their tents. In fact, I’m sure that I wasn’t the only vendor to run out of product because we underestimated the number of people who would be buying from us. The artists were there in participating as well. 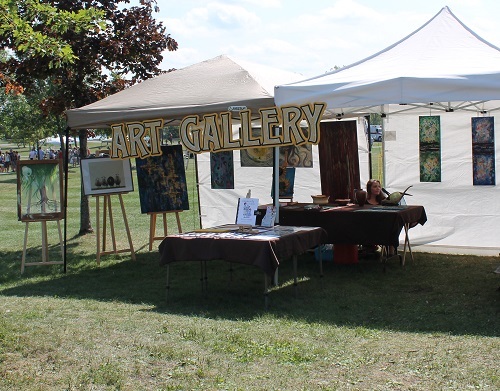 Jacqueline Milner and Sandra Taylor-Hedges did a chalk mural of trees on the concert wall below the clock tower as a demonstration and there were galleries displaying artists’ works. Not only was there lots of garlic, produce, art and prepared food but there were events to entertain the kids as well. 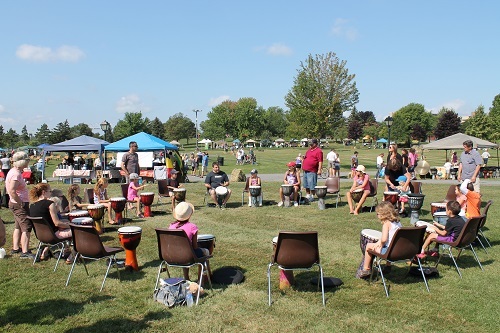 Below you can see a drumming demonstration where the kids got to participate. 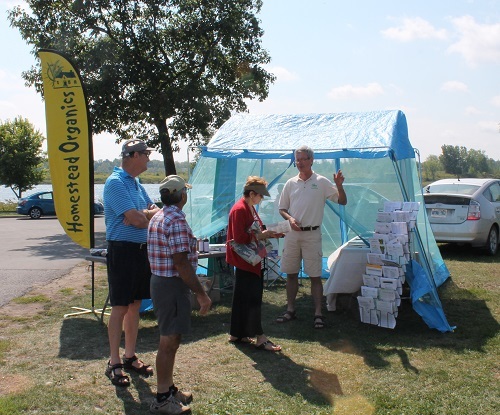 One of the main sponsors for the event was Homestead Organics and you can see Tom Manley possibly discussing the benefits of organic living with an interested shopper. 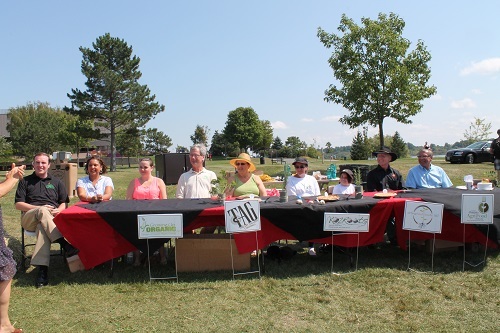 We even had a bunch of local politicians sitting down tasting pies for a baking contest. You will notice they are all smiling with the thought of getting a piece of the pie. 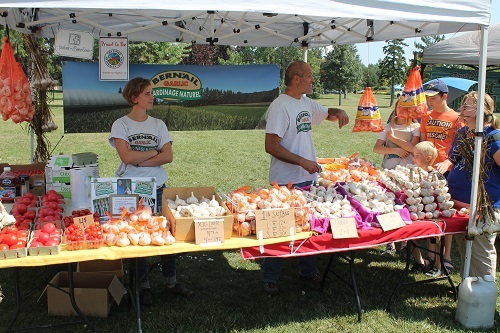 This event could indeed turn into a real jewel to celebrate not only the garlic harvest but local products in general and a great way to end the summer.